An introduction about ancient science techniques and demonstrations to release pain. Want to be Super Genius! Want to get better grades all the time in School! Never worry again about your kid’s studies because every kid can be made genius…. Vetha made it easy for you … Register for Super VEG- Brain Workshop…. Activates the Pituitary and Pineal glands to optimize regulation of hormones in the endocrine system to balance body and mind coordination. Who can attend? Any age group can benefit from this workshop. For kids, it helps them with academics and for adults and seniors it helps with retaining memory. A workshop on applying ancient system of medicine for a healthy vision. * Ancient science techniques for improved vision within minutes. * Improve blurry vision, diminished vision, leading to optimum eye sight. * Help release headaches, ophthalmic migraines, eye strain, sinus congestion, and discomfort in the eyes due to hyperacitity, stress and tension. * Preventive measures for healthy eyes. *Safe with no side effects and work for all ages. “All attendees were able to read a few more lines from the eye chart immediately after the treatment with Dr. Shan.It takes almost a year for modern science to make a person improve from line 1 to line 2 from the eye chart. I am stunned to see that Dr. Shan can make this happen in less than 5 minutes.” Dr. Rajan Aurora, Optometrist. Who can attend? Any age group can benefit from this workshop. Irrespective of whether you are wearing eye glasses or not. You can get rid of your eye glasses if you are wearing them after practicing the techniques taught in the workshop. If you are not wearing eye glasses now and would like to prevent wearing one in the future this workshop is your solution. Anyone having any issues related to eyes can attend to workshop to get better. 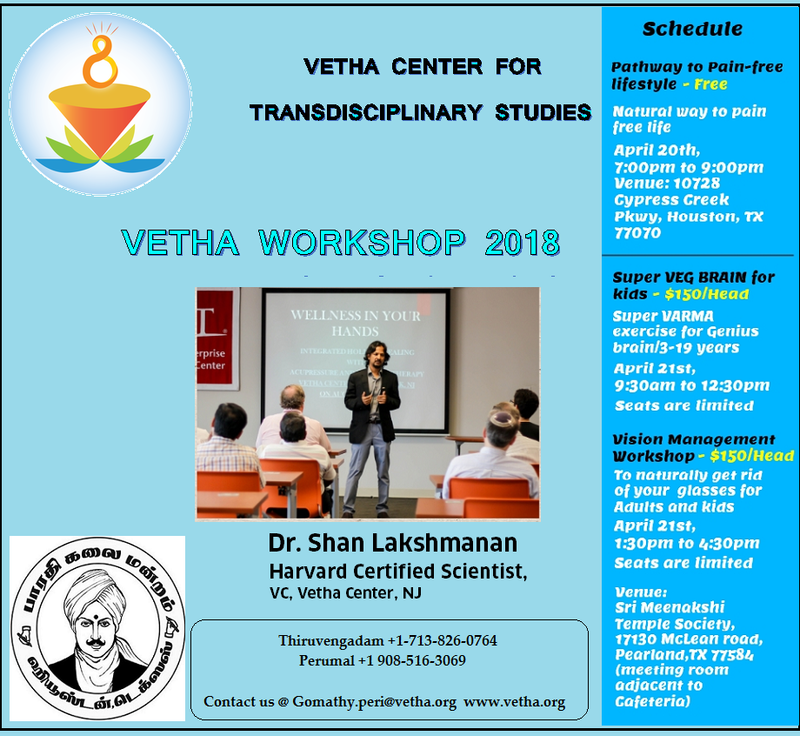 Shanmugamurthy Lakshmanan (Shan) is the vice-chancellor of the Vetha Center for Transdisciplinary Studies and a Harvard trained Scientist who received his Ph.D. in Applied Physics from Rutgers/NJIT. Shan is also the Vice President of international research, a scientific advisor and head of the Indian Medicine, Sciences and Culture Division (IMSCD) at the World Institute for Scientific Exploration (WISE-Harvard). Furthermore, he is the Founder and Editor-in-Chief of two peer reviewed international journals and serves in the Editorial board of five other International journals. He also serves as the chairperson of the R&D division of the Association of Ayurvedic Professionals of North America (AAPNA) for its Harvard-AAPNA Research Project (HARP) as well as a member of the Scientific Committee in the Integrating Spirituality with Organizational Leadership (ISOL) Foundation. He is also founding member of SKY-USA, a non-profit organization which has branches all over the United States. Shan has published his research work in several international journals and books. He received the Aryabhatta award for his research in Ayurveda and the ISOL community program award for indigenous Knowledge and Culture. Shan is a scientist, author, editor, poet, farmer and a loving husband and father to his two little children.